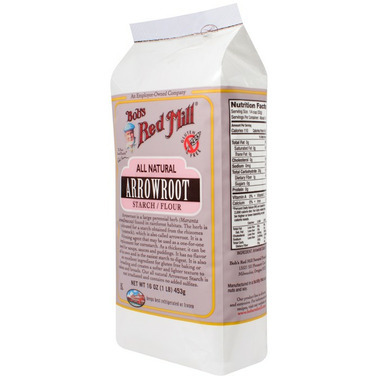 Bob's Red Mill Arrowroot Starch is an easily digested starch extracted from the roots of the arrowroot plant, Maranta arundinacea. The starch is used as a thickener in many foods such as puddings and sauces, and is also used in cookies and other baked goods. The arrowroot plant is native to the tropics of South America. It has a long history of cultivation by native peoples, who developed an extensive treatment process for extracting the usable powder from the roots. The roots are washed, scraped, beaten, soaked, pulped, and finally forced through a sieve. The liquid and fine powders that make it through the sieve are dried, leaving the useful arrowroot powder behind. Arrowroot starch does not turn sauces cloudy, and it works at temperatures below a simmer. There is a secret to a smooth sauce with arrowroot starch. Bring the sauce base to a simmer over medium-low heat. Next, whisk ¼ cup water and 2 Tbsp. arrowroot starch together to make a slurry. Stir the slurry into the simmering sauce and heat for one minute or until thickened. 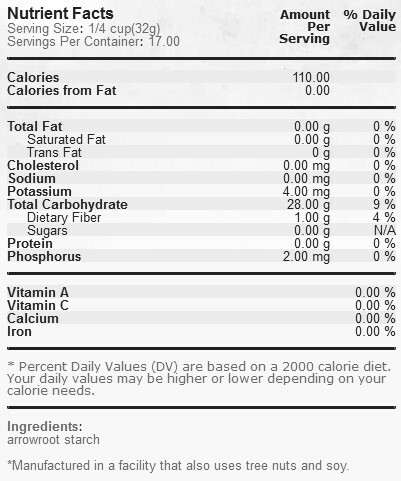 Arrowroot starch is also gluten free. It’s an excellent substitute for cornstarch and flour as a thickening agent in sauces, gravies, pie fillings, and puddings. Arrowroot starch is neutral tasting and tolerates acidic ingredients, such as citrus. The starch also freezes well and dissolves well at lower temperatures. In fact, it must be cooked over low heat as it doesn’t endure high temperature cooking and does not reheat well. Also, arrowroot does not do well in milk-based cream sauces (it changes the texture), but bakes well in cakes, cookies and biscuits made with milk. I use it for thickening diy hair rinse and other products. Also for cooking, it's great! A little pricey, however for now I have not found better. I use it to replace cornstarch in making pudding, baking savoury and sweet goods and also making a light creamy texture to cooked food...mix a little water or milk and a small portion of arrowroot...then add it at the very last minute to your cooking. great for baking and thickening. Great mixed with rice and tapioca flour for gluten free baking. Also superb as a replacement for corn starch where ever needed. love this product for use in grain free pizza dough, sauce thickening and even home made deodorant! I use this in my gluten-free bread that I make. The bread is delicious with great texture so that's enough for me. I'm sensitive to tapioca and cornstarch, so this arrowroot starch is a great replacement. I also use it on my hair if the roots are too oily. Love it! I use it as a loose powder. Really buffs out imperfections, though it is a bit drying! Great for thickening up cheese sauces, cream sauces and gravy. I'm vegan and I use it as a thickening agent instead of using real creams, cheeses or wheat flours. I used to use wheat flour to thicken sauces but it would leave an unpleasant flour/gluten taste which ruined the recipe. The arrow root powder does not leave behind any flavor, just a nice thick sauce. I also use it to thicken mixtures when I bake. Makes the best mac and cheese and gravy! Great for thickening dips and creamy salad dressings. Great stuff, used to find it a superstore in their natural food section, but I haven't seen it in over a year. Glad well.ca sells it. My daughter has food intolerances to corn, potato and tapioca. I recently discovered Bob's arrowroot starch and it has opened up so many possibilities for cooking for my daughter!